One Day Dentures | Dentures In A Day. How Can You Do It? 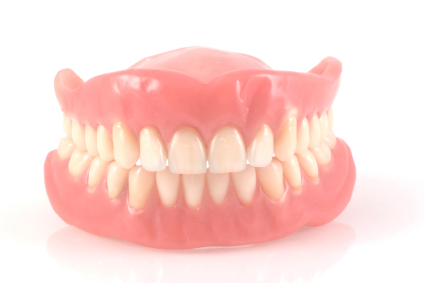 The phrases "One Day Dentures" and "Dentures in a Day" can mean 2 things! It can mean getting a set of dentures on the same day that your remaining natural teeth are taken out, OR it can mean getting dentures that are made from start to finish within 24 hours, where you already have full dentures. These are actually 2 quite different things! Getting a set of dentures on the same day that your teeth are removed is usually called "immediate dentures" by dentists. You go through a number of steps as the dentures are constructed. It usually takes a couple of weeks. On the last day, when the dentures are ready, you get your remaining teeth taken out and the dentures are fitted into your mouth immediately. The main advantage is that you never have to go around without any teeth. Also, the gum tends to heal up faster because the denture is preventing any saliva or food particles getting in there. The other type of One Day Denture is really for people who have ALREADY HAD ALL THEIR TEETH OUT, and involves getting the whole construction process accomplished inside of 24 hours. This really IS compressing all the laboratory work into an incredibly short space of time! You need a dentist who is experienced in this sort of work, and who has a dental lab attached to his office. The actual steps required are almost the same as for normal dentures, but just in a much shorter time period. The dentist takes the moulds, and sends them straight next door to the lab guy. The lab guy makes up some wax dentures for a trial fitting, and sends them back to the dentist. The dentist does the trial fitting, takes measurements, and sends the stuff back next door. And so on. Basically, the dentist and the lab guy are working together extremely efficiently to cut the time required right down. In some states in the U.S. and some other countries, a "denturist" will do ALL the work. So how do these two versions of "Dentures in a Day" stack up against conventional dentures? Are there any advantages or disadvantages? Let's take a look at immediate one day dentures first. Advantages; no need to go without teeth. Faster healing. Disadvantages; the gum will shrink under the denture within 3 to 6 months, and the denture will need a reline. If you don't mind a little discomfort for a few days, and the need for relining the denture at some point down the line, immediate dentures are just fine. You can even do a home reline in the early stages with denture reline kits. BUT you will need a professional reline eventually, to get the best from your denture. And what about the 24-hour type of One Day Dentures? Advantages; You get your dentures FAST. Disadvantages; The dentures may not fit so well. The dentures may not look great. Like everything in life, if you want something FAST, you may not get the quality that you could otherwise have. It's a personal decision. For a lot of people, speed may be the most important thing, and that's fine. Dentures in a day will give them what they want. But if you're looking for the best fit, most comfort, and a dazzling, natural-looking smile, dentures in one day may not be your first choice.